How do soldering irons work? The basic purpose of a soldering iron is to create a bond between two workpieces using electronically heated soft metal (ie, the solder). The soldering iron supplies heat to the soldering tip, which is used to melt the solder. The melted solder forms a bond in the joint between two workpieces. Soldering is useful for many purposes, including jewelry making, electronics, home projects, auto repair and much more. The best way to understand how soldering works is to break down the different components of a soldering iron, and what they do. The crucial component of any soldering job is, of course, the solder. Solder is made up of soft metal alloys, usually composed of a combination of different materials. Typically, this includes a low percentage of a soft metal alloy (such as zinc or copper) and a high percentage of tin. Tin is also a relatively soft metal, but it helps make the bond between the workpieces stronger. Another major component of solder is flux. Flux is a chemical agent that comes in gel form which is used as a catalyst for soldering. It used to transfer the heat from the soldering iron to the metal so that the solder can form a chemical bond with the metal. Many solders already contain flux in the core of the soldering metal. These are called “core solders.” You can also buy flux separately and add it yourself while soldering. The solder itself comes in the shape of a spool. The other major component of a soldering iron is the iron itself. The iron is made up of a handle and a tip. There are a number of different styles of soldering irons, but the basic purpose is the same. 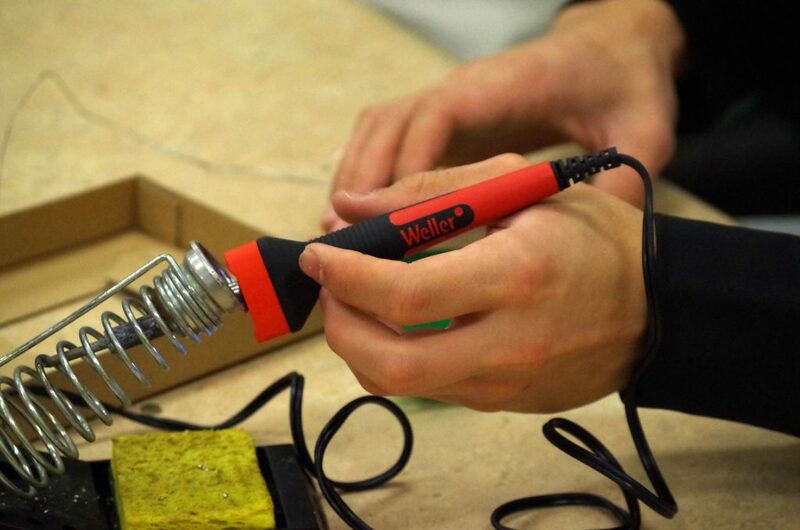 Soldering irons rely on electricity to produce heat. When electricity flows freely, it doesn’t produce much heat. But when electricity is met with high resistance, the buildup of electricity and high movement of electrons creates heat. The basic function of the iron is to create a high resistance electricity flow. This resistance causes the electric current to heat up. This heat flows to the tip, which gets hot and can then be used to melt the solder. There are five main types of soldering irons available. These are stations, adjustable irons, pencil irons, cordless irons, and torches. The first four operate on the same basic system described above. The soldering iron contains a high resistance electrical current that heats the tip, and the heat it used to melt solder that bonds workpieces. The difference between the first four main types of soldering irons has more to do with user interaction than functionality. You can read more about these differences here. Soldering torches are slightly different, and are technically not irons. They are not effective for most basic soldering iron projects because they produce far too much heat. But, they are useful for soldering harder metals or for brazing. You can read more about torches here. What are the best types of soldering irons? Generally, this depends on how you intend to use it. But if you want more information on this topic, definitely check out our guide on the best soldering irons for any budget. We cover this topic more in-depth there, and provide all of the information you need to find out which one is right for you.